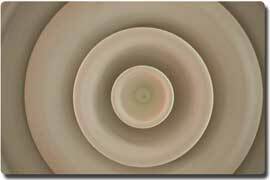 Home Improvement Clinics - This online clinic teaches the basics of cleaning your air conditioning vents. Cleaning a Heating or Air Conditioning Vent - If you have an air conditioning or heating vent that is coated in dirt or grime and you would like to clean it then we will show you how to clean it properly with this do it yourself air conditioning and heating home repair. (*) You may need either a flat or phillips screwdriver depending on the screw used. Additionally on some vents you may be able to use a 1/4 inch nutdriver or socket wrench. Step 1 - Safety First - Make sure that you have read our disclaimer and are following all safe practices. If you are unsure DO NOT attempt this or any repair. Step 2 - Prepare the Area - Set up the ladder and dropcloth (for ceiling mounted grills). Put a dropcloth under the vent to be cleaned and then set up the ladder just below the vent. Note: Make sure that the ladder is a safety ladder and is stable and safe so you do not fall. Step 3 - Prepare the Cleaner - Mix warm water with a few drops of soap into a bucket and set it aside for now. Step 4 - Prepare Yourself - Put on your goggles and breathing mask and get the tools you need for the next step. Step 5 - Remove the Vent - There are usually two to four screws that must be removed in order to take the vent down from the opening. Remove them carefully taking particular care to prevent the screws from stripping out the slots in the head of the screw. Also remember that the vent may move and or fall once several of the screws have been removed so keep one hand on the vent to prevent it from falling. Step 6 - Clean the Inside of the Duct - Once you remove the cover clean the inside of the duct (hole in the ceiling of floor) using a vacuum cleaner first if you have one. Once you remove the surface dust use the sponge with soapy water to clean the remaining dirt. The idea is to remove any dirt or grime found inside the duct. Clean as far inside as you safely can but don't use excessive pressure on the inside particularly if the duct is not made of sheet metal. Once you are finished dry the area with a soft dry towel. Caution: Watch for sharp edges inside and outside the duct. Step 7 - Clean the Grill - Next use the sponge to clean the grill. If the vent is heavily coated with grime or other hard to remove materials then you may need a stiff brush to get it off. Once you are finished dry the area with a soft dry towel. Caution: Watch for sharp edges on the grill. Step 8 - Inspect the Grill - Look closely at the grill for deep pock marks of rust or other damage that cannot be cleaned. This is a sure sign that the grill is old or has seen some intense wear and tear. 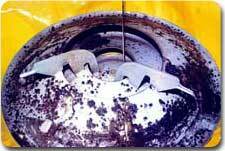 If the grill is damaged or cannot be cleaned then you should replace it. Note: Don't buy cheap grills to replace the existing grill. These can cause many more problems then they are worth. Make sure you get a high quality grill that will last for years to come without the problems associated with cheap grills. 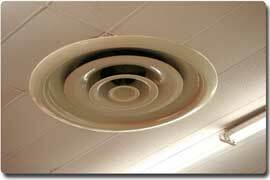 If you need them you can buy professional quality ceiling grills from our online store. Step 9 - Reinstall the Grill - Take the cleaned (or replaced) grill and place it back over the hole. Then use your hand to restart the screws so that they will not fall when you reinstall them. Be careful to align the grills properly and secure the vent so that they will not fall. Step 10 - Repeat the process - Repeat the process for each grill that needs to be cleaned. Technicians Note on Dirty Grills: A unit with extremely dusty or dirty grills on the supply side (not filter grill) may indicate that your filtration system is not doing its job. 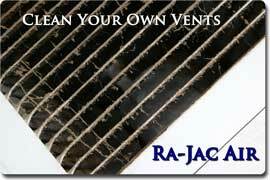 There may be efficiency robbing dirt and grime on your evaporator coil. Consult a professional to have your evaporator coil inspected and cleaned if needed.